Salaried people with salary less than Approx Euro 50000 are required to be have medical insurance from Govt. German public insurance computes the monthly premium based on income only. The public system disregards age, gender as well as pre-existing conditions. Public insurance in Germany is a family insurance. Which means all members of the family without their own source of income (and therefore own health insurance) are covered under the umbrella of one public insurance. With public insurance you have good coverage for all major treatment and medical emergencies. In comparison with lots of other countries, the German public health system is still quite good. It is therefore impossible to describe all the treatments etc. that are covered with pubic insurance. For a family public insurance is cheaper, as in private each individual is insured separately. It enables to get better services and better medicines. One doesn't have to pay quarterly fee. Mostly medicines are also 100% covered. Once switched to private one can not go back to public one. If both partners are working, one can go for public and other for private. Private insurances usually offer good premiums for not using it the whole year. One is not forced for generally required regular procedures, e.g. visiting to dentist regularly is mandatory under public but not under private. There is more work under private as one receives the invoices from doctors and the person has to send them to the insurance company for the claims. There is usually enough time, to claim and then pay the invoices. You may opt to get different treatment for each individual. Usually people sign for best conditions for kids as they need more visits to doctor and medicines. At most practices, waiting time for private patients is also shorter. One also gets more tax benefits. So one gets some money back from finanzamt when declaring tax. So take your decision carefully. 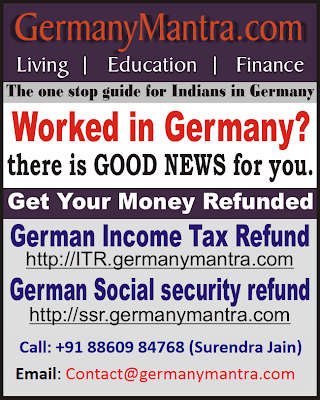 If you are under compulsorily insurance then get it at the earliest within first month of your entering to Germany. The premium payment starts from the day you enter into Germany, even if you get yourself insured afterwards. So even if you have insurance from India, it is wise to get your health insurance at the earliest, so that you can get its benefit, in case of need.